The first member of his family to appear in Deal was William Franklin having recently married Susanna Lambert in Greenwich. Their first Child was baptised at St Leonard’s, Deal in 1810. Initially, he traded from a shop and house in Market Street until 1812 when this property was advertised ‘To Let’ in the Kentish Gazette. From the baptism of William Henry Franklin in 1813 he is listed as a Draper of Lower Street. In Pigot’s Directory of Kent in 1824 he is entered as a Linen Draper trading from 171 Lower Street (96 High Street after renumbering) and in 1826 as a Linen Draper and Hatter. It seems that William Franklin may have died before 1840 as the Pigot’s Directory for that year lists the business as William H Franklin, Haberdashers 173 Lower Street. William is also absent from the 1841 Census where his wife Susanna is listed with her family including William Henry, a Draper. As time went on William H Franklin began to diversify and his shop at 3 High Street was offering Photography, Picture framing, a Fancy repository and general draper, Haberdashery and imports of Berlin wools and German yarns. The earliest reference we have for him trading at this shop was 1868 and datable photographs are known from 1863. William Henry Franklin died in 1891 aged 78 but several of his children continued in his footsteps. His Photography store (still bearing his name in 1903) continued at 3 and 9 High Street most probably run by Henry Franklin as by 1913 the shop at 3 High Street was called Henry Franklin and Sons. In recent times this shop became Francis Day’s who continued the Photography tradition. The shop is now occupied by the Oxfam Bookshop. In 1891 Frederick Franklin (b1852) was running the Drapers at 4 High Street. By 1899 this had moved to 11 High Street and was later run by John Franklin (b.1858) at 9 High Street who also offered Stationary products. Dover Museum Library for early Deal Photographs. British Library early Deal Guides. 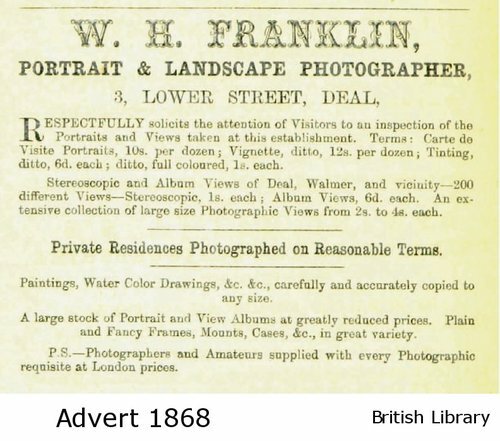 The Franklin family began as Drapers of Deal in 1808 but by 1853 William H Franklin was offering photography in his Lower Street store. This was advertised in Melville’s 1858 Directory of Kent. 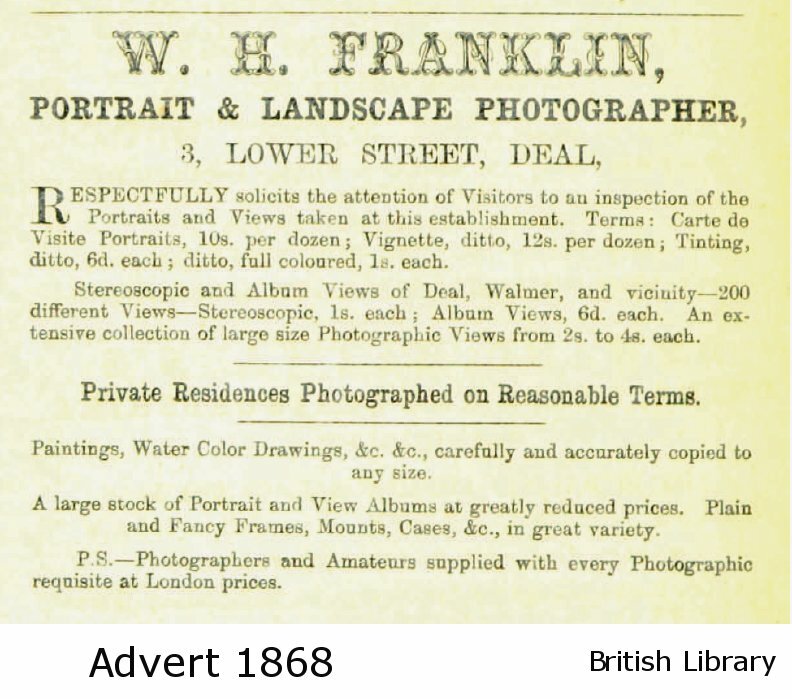 William H Franklin was an excellent photographer in his own right and when not taking portraits and family groups photos for ‘a moderate charge’ of clients at his Studio, took many noted photographs of local scenes. He was especially interested in seascapes producing a group of fine photographs around ‘rough seas’ which included one called “Heroes of the Goodwins” which was highly praised and much used for illustrations. Later his Photography shop was run by his son Henry Franklin. 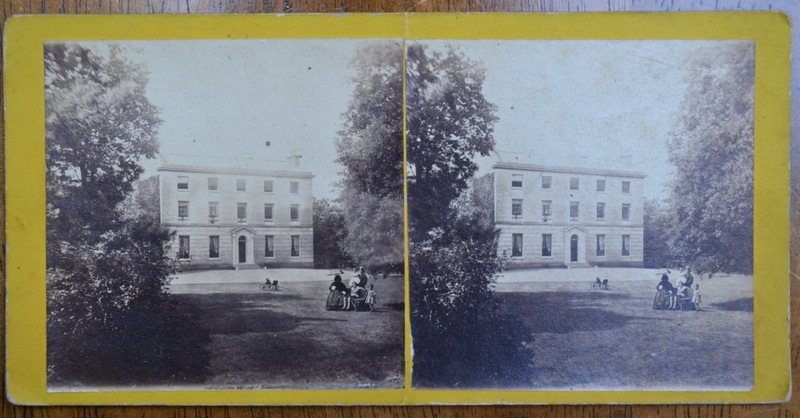 Franklin stereoscopic original brought to the 2017 AHRG history exhibition. This is Ripple Vale House now a school and Grade II listed. Birthplace of Field Marshal Sir John French, Earl of Ypres (1852-1925).